SeaLink’s commitment to the Kangaroo Island community spans over 30 years and we are passionate about its future. SeaLink strives to support the community wherever possible and given the remote location of Kangaroo Island, our support is primarily in the form of sponsored ferry travel. This assistance helps to ensure a quality of life that may not be possible in some cases. In 2018 our SeaLink CommunityLink Program supported over 50 Kangaroo Island community and sports associations, charities and events, and donated over $200,000.00 in ferry travel. CommunityLink is only available for Kangaroo Island based organisations. Submissions for 2019-20 are now closed and will re-open in February 2020. SeaLink receives many requests for travel, financial, prizes and gifts support, however, our priority is to support Kangaroo Island to assist with the development and growth of its community. If you are seeking sponsorship which will support the Kangaroo Island community please click here for a general sponsorship application form. Please read the SeaLink Sponsorship Conditions & General Information carefully before submitting your application. The SeaLink Kangaroo Island Racing Carnival is held in February each year over three days. The Carnival features two race meetings, a casual smaller affair on the Thursday and KI Cup Day on the Saturday with the feature race being the Dudley Wines Kangaroo Island Cup. Hundreds of visitors from the mainland flock to the island, many making a long weekend or short break holiday out of their stay. If you are interested in more information on our 2020 KI Cup Day Packages, please register your details here and we’ll send it to you when it is released. Or you may want to consider taking a self-drive or touring or caravan holiday allowing you more time to explore the island. SeaLink is proud to be the Diamond Sponsor for the Tour de Cure SA Discovery Tour event. The money raised from this tour which will go towards 4 major cancer research projects at the Flinders Foundation and the University of South Australia, as well as 3 grants to local cancer organisations on the mainland and Kangaroo Island. This cycling tour will involve a return trip from Victor Harbor to Kingscote on Kangaroo Island and will be run over 3 stages with a total of up to 450kms over the 3 days. If you’d like to participate as a Tour Rider, or Support Crew, please visit the Tour de Cure website. Find out more. KIFL is an affiliated member of the SANFL. There are 5 teams (Kingscote – Hounds, Dudley United - Eagles, Parndana - Roosters, Western Districts – Saints and Wisanger – Panthers and each week during the season they host A Grade, Reserves and Colts grade teams. Given the small population of Kangaroo Island, it is difficult to field full teams and SeaLink’s ferry travel sponsorship assists volunteer players to travel from the mainland to play. 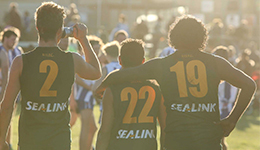 SeaLink’s sponsorship also enables team players to travel to compete in SA country football carnivals and to attend development opportunities. SeaLink also co-sponsors the ‘Club of the Year’ Award with the SAFC. 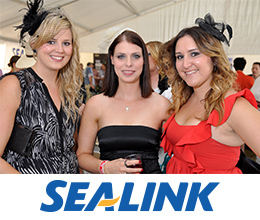 SeaLink is proud to be a sponsor of the Kangaroo Island Netball Association. Our sponsorship enables past and volunteer players to travel to Kangaroo Island to play in matches and importantly allows for Kangaroo Island based players and umpires to travel to the mainland for academy visits, country carnivals and player development opportunities. SeaLink also sponsors the ‘SeaLink Star Volunteer Award’ each year where volunteers from each club are nominated. KICE was formed in 2005 as a multi-campus school from the three KI Area Schools – Penneshaw, Parndana and Kingscote. KICE has approximately 700 students located across the island. SeaLink’s sponsorship assists students who can be disadvantaged by the issues associated with living in a remote and isolated community. With the assistance of ferry travel, SeaLink supports hundreds of students every year to take up various opportunities on the mainland including sporting carnivals, performing arts, music cultural excursions and Careers Week. SeaLink also plays an integral role in mentoring and influencing the development of young people through the Virtual Enterprise program. KI Dolphin watch is a research program monitoring wild dolphin populations around our coastline. The program involves Kangaroo Island school students and community members collecting data about local dolphin populations, their behaviours and their habitatThe organisation uses non invasive photographic techniques to identify dolphins and their group structures with the ultimate aim of protection and conservation. Find out more. Rebuild Independence Group (RIG) is a community-based, non-profit organisation founded in 2013 with the mission of rebuilding the Schooner Independence, the first vessel built in South Australia. They have successfully raised enough money to build a boathouse at American River on Kangaroo Island. They now need to raise $20,000 to produce detailed boat plans that will comply with the strictest "survey" standards and will enable Independence to carry fare-paying passengers when finished. The partnership between SeaLink Kangaroo Island and the South Adelaide FC will promote the community involvement that both organisations play in assisting the young people of Adelaide's southern suburbs, Fleurieu Peninsula and Kangaroo Island in particular to meet their full potential. Find out more.